This video shows how to setup MRO service estimates with Service Profiles which are predefined quoting templates for Work Order or Jobs. These profiles can be created by your service manager or engineer to help facilitate the quoting process. They can add inventory and labor needed along with the costs and pricing. These predefined templates or service profiles reduce errors and can be used over and over again and even tweaked as needed. Using a Service Profile in a job does not mean you can’t make changes – you can make changes on the fly. The purpose of Service Profiles is to give your team a quick and easy way to quote or create jobs and reduce errors. Our solution designed specifically for the MRO (aviation or heavy equipment) and is perfect for the small to mid-sized MRO. Our ProMRO solution is built on Acumatica the Cloud ERP.Watch our short video and contact Clients First for a full demonstration of ProMRO. Clients First Business Solutions of Texas, located in Dallas Fort Worth, is in the business of helping small to medium sized businesses implement the best Enterprise Resource Planning (ERP) software to assist in all areas of their organization. As one of seven offices across the United States, the Clients First Texas office has over 20 years focus on manufacturing and maintenance, repair and overhaul (MRO) companies in US and also in over 11 countries worldwide. 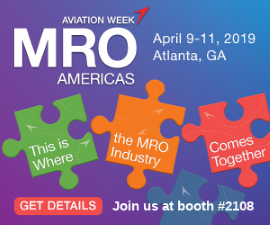 We originally developed our MRO solution for a few of our Dynamics AX customers. Our managing directors saw a gap in the software marketplace for an easy to use affordable software solution for the MRO. 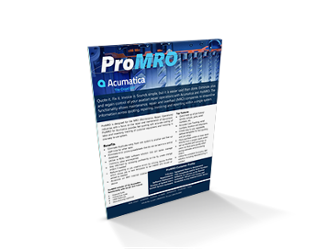 Acumatica met and exceeded our expectations in pricing, but also in functionality, therefore our team developed ProMRO for this fastest growing ERP solution. Acumatica was the perfect choice of software solutions with it’s unlimited user license model and full ERP functionality in easy to use Software. Please watch this short presentation and contact us to answer your questions. We can schedule a demonstration for you. Contact your Acumatica Partner, Acumatica or Clients First for more information.